Triptych | Trinity a performance by proxy for the CrossCut Humane Slaughter Acts Performance Festival held at the Slaughter House Space in Healdsburg CA. For this work the performance are is staged with a vintage school desk atop which rests a cassette player. 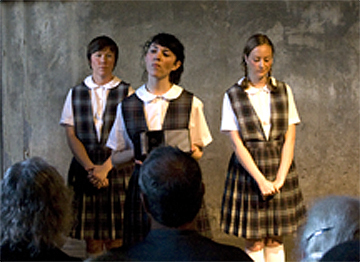 Each of the three performers take turns picking up the player, moving front and center and playing a recorded true* story from my time at Catholic school.